Something super exciting happened last month – I got invited to my first ever press event, thanks to Leeds Loves Cocktails! I simply ADORE cocktails (as you might have guessed from my posts about the Cocktail Experience, the Alchemist, and the Maven). So when I found out that Leeds Loves Cocktails was coming up this June, I was crazy excited. Then I found out it was the same week I was going to Keswick with my boyfriend’s family. I was less impressed (and may have cut my trip down to half length so I can go to some stuff anyway). Luckily the Press Launch took place in May, so I was more than able to head along. I headed down to Headrow House in the rain. I’ll admit, I was pretty nervous. I was sure there were to be some of the amazing local bloggers I enjoy following on Instagram there, and I was worried I’d say or do something dumb. There was also a Rumbullion Rum Punch, and both drinks were freely flowing (and delicious). But the real moment I started to relax was when I got talking to the other bloggers. The first person I met was Culture Bean, who was super friendly and helped introduce me to a load more people. Another moment that made me feel at home was when people started to take photos. I’m used to TC sighing impatiently when I want to take a photo of our cocktails before we can drink them. But here I was perfectly at home. The event began with a bit of a talk from the team behind LLC. I’m not exaggerating when I say the energy beamed off them. All were totally psyched to be part of the event, and the amount of good-natured banter between them showed this was more than just an event for them – it was a labour of love. Nick Fox, the founder of the event, did most of the talking. Leeds Loves Cocktails is an annual event, started because a group of Yorkshire-based master mixologists were annoyed that London got all the good cocktail events. They launched the first event in 2013, added Manchester in 2016 and this year are also running events in Liverpool and Nottingham. But Leeds is the original, and this year it’s back with a vengeance. 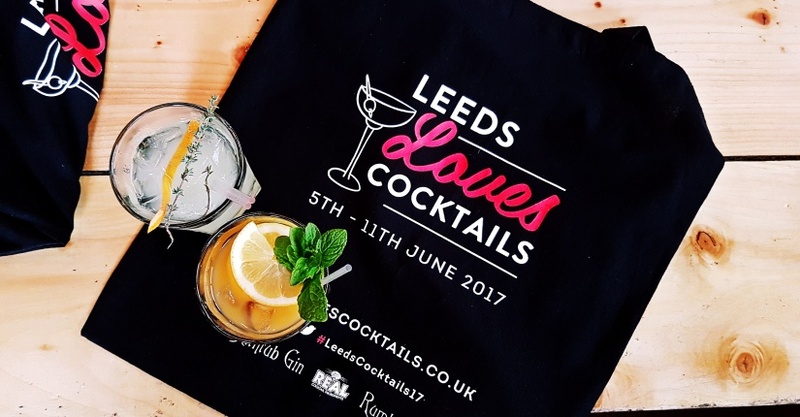 Running throughout the first week of June, it encompasses 36 of Leeds’ best bars and 32 awesome drinks brands. Unlike the year’s earlier Cocktail festivals, it doesn’t bring all the bars together under one roof – it encourages you to go out and visit the different venues, to get to know the lay of the cocktail land. And it’s more than just drinking for fun. A lot of the events are actually targeted at industry experts, such as the Jigger Beaker Glass workshop on the Monday of the festival. It’s an all day event, so you’d need to be a pretty serious cocktail lover to go along to that. Overall, Nick said, it’s about drinking “better not more”. That’s the mantra of the festival. Although wristbands may get you access to cheaper cocktails, that’s not so you can get trashed – it’s so you can try out some of the best drinks Leeds has to offer. Following a gin tasting with Bathtub Gin (I’m still not a neat gin fan, sorry! ), the event was rounded off with a group cocktail making session. We were divided into groups, and given a bag of ingredients, Ready Steady Cook style. The rules were, we had to incorporate as many of the ingredients as possible, as well as a flavoured Re’al syrup. We also had access to basically anything from behind the bar. My group was given Ocho Tequila, which is apparently a sipping tequila, not a shotting one. We were taught how to taste tequila – basically ignore your first sip, because it will just taste heavily of booze, and pay attention to the later ones. Our other ingredients were aztec chocolate bitters, grapefruit juice, blueberries and ground nutmeg. This led to an extended debate over our options. Someone wanted to use a pumpkin syrup and the nutmeg to go for an american pie type drink. Some suggested something fruitier, with raspberry, grapefruit and blueberries. But we ended up with, honestly, something I’d never think to try. Take a boston shaker. Add in the tequila, both syrups, the bitters and the nutmeg. Shake. Strain into the glass. Top up with the beer. Thread a cocktail cherry onto a sturdy rosemary spring and balance on top. Serve. See what I mean? It’s really not my usual cocktail type (I love sweet and fruity drinks), but it was actually pretty cool. The name could have done with some work though, it was thought up on the spot when we were asked what it was called. The beer was called Lindeman’s Kriek. When the time for testing was up, we had to create the cocktail in front of the panel of judges (aka a few of the people running the event). While I started making the cocktail, others in my team presented the judges with a shot glass of tequila to taste – it’s all about the presentation! They also told the story of the cocktail and why we made the decisions we did. I handed over the partially completed cocktail to a team mate, and prayed I’d got all the ingredients right. But in the end, another group managed to use every single one of their ingredients to create a gorgeous looking Bathtub Gin cocktail that I’d totally drink. And they even came up with a good name for it – A Berry Long Bath. Their cocktail is actually being sold at Jake’s Bar throughout the festival. Totally not jealous or anything. And with that we were finished! I headed home with a goody bag containing two wristbands, and an event plan. The festival kicks off tomorrow with a ton of awesome sounding events. Luckily I’m around for a few days of the festival, so I’m hoping to get to use my wristband to buy some tasty drinks. I would love to see the Leeds Bartender of the Year Competition, taking place on Tuesday 6th at Thewlis. The Yorkshire vs Italy Cocktail Competition sounds amazing – pitting my favourite country against the county I now call home. That’s taking place on Wednesday afternoon. The most awesome sounding event of the week is Thursday’s Absolut Roxy Masters. Nine holes of mini golf and then a vodka masterclass. What’s not to love? The wristband gives you free access to most of the events, plus lets you buy cocktails for £5 from participating bars, and they’re on sale now. Hope to see some other cocktail lovers around the town next week! Disclosure: I attend the Press Event free of charge and received two free wristbands to Leeds Loves Cocktails. All opinions of are my own. Here’s my full disclaimer.